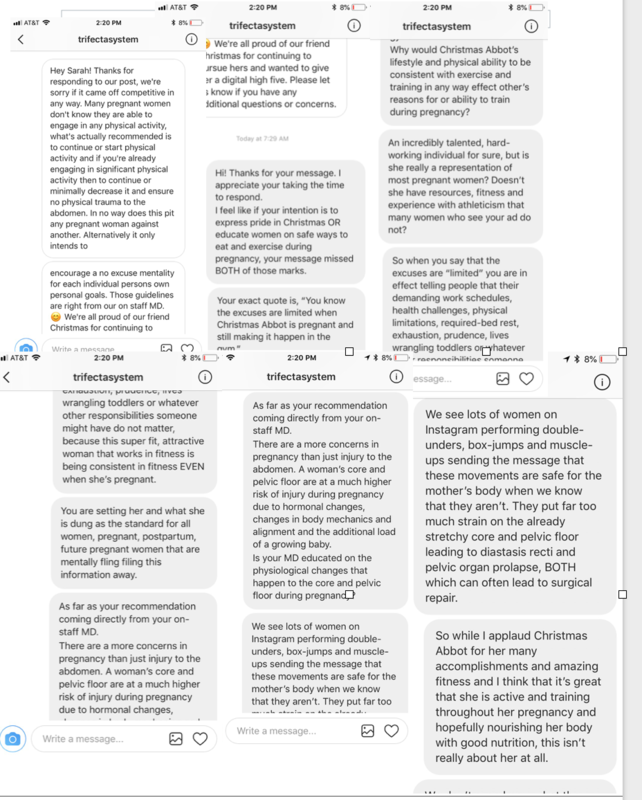 Having an interesting discussion in my DM’s this morning with a company that used one woman’s alleged (I say alleged because it’s an ad and we don’t actually know what this individual’s life or body is really like) fitness and training practice during pregnancy as precedent for “no excuses” NOT to train and track nutrition. I confronted the company for this message and they maintain that their intention is only to encourage others to not use pregnancy as an excuse to NOT pursue their personal goals. We had a respectful discourse. Where I shared my concerns with the messaging. They also mentioned that their “on-staff” MD approved this message. First of all, you don’t encourage others to care for their bodies in the way that THEIR bodies require care by setting one individual as the standard for that that looks like. I spent my third pregnancy being affected by every image I saw and idea I had created about how fit and pregnant women needed to be. I believed all the messaging that told me that pregnant women are no different than non-pregnant women, they just have a baby in tow and therefore have to be a little stronger. I spent my third postpartum experience believing that birth was a minor thing and I needed to get right back to my fitness regimen, “get my body back, ASAP” to feel normal and regain my identify as a “fit mom”. Where did I get these ideas? I will FULLY admit that a lot of them came from my own pride and need to look and feel a certain way. I didn’t want to lose my strength or ability. I didn’t want to lose individual self in the sea of babies and motherhood, again. But this was also the first pregnancy in which I was working in the fitness world. This was the first time I was bombarded by women working their asses off through pregnancy, looking exactly the same way they did pre-pregnancy, except plus a cute bump. And that was shaping my ideas and expectations about MY OWN physique in pregnancy. And you know what? I pushed too hard and hurt myself. I hurt my gut, I hurt my pelvic floor and core, I hurt my mind and mood. So when I saw this ad last night I thought, “OH HECK NO.” and I confronted them and when they wrote back justifying their post I confronted them again with more information and my strong experienced opinion. Because I have women come into my gym every week that need to be reminded that training when pregnant or postpartum has to look different, HECK training even when you’re not pregnant should really look different than what is often most popular if you’re interested in longevity and sustainable results, I get fired up! I encourage my clients to look at what THEY can do TODAY and not to what someone else MIGHT be doing, ESPECIALLY not Fitspo or fitness advertisements for products! Because I HATE the idea that women feel like failures in fitness because they don’t look like a stranger that is being set as one of the many standards of what we should all look like.